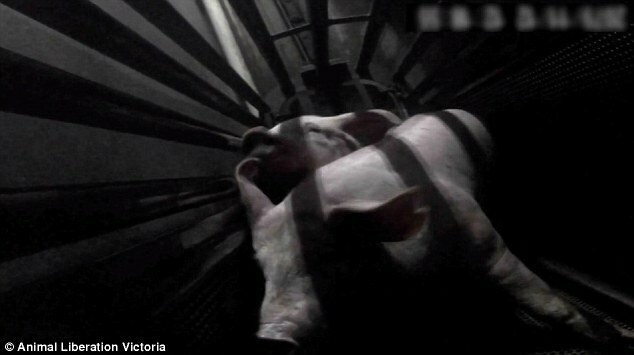 Confronting footage of pigs apparently being forced into 'gas chambers' as they scream and try to escape before they are gutted and drained of blood has been captured by a group of animal activists. 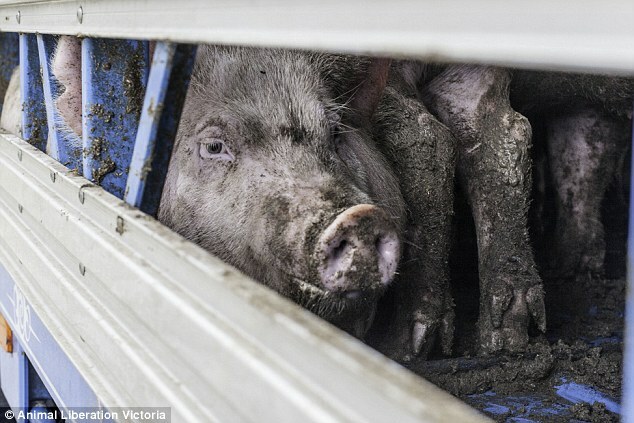 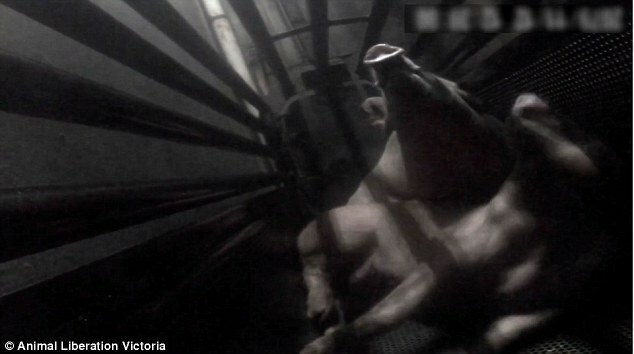 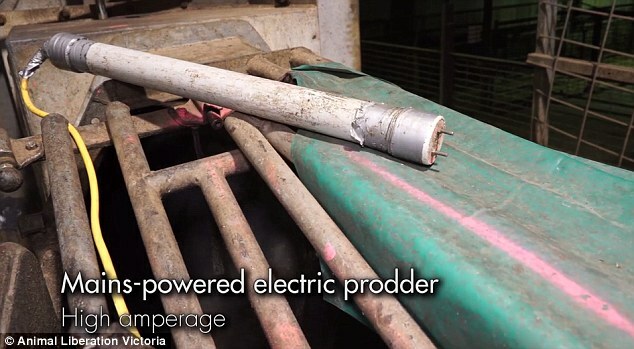 The footage is believed to have been recorded inside slaughterhouses in Laverton and Benella, Victoria – which activist groups claim have been recognised for industry ‘best practice’ – and appears to show pigs being herded into cages by workers wielding large electronic prodders. 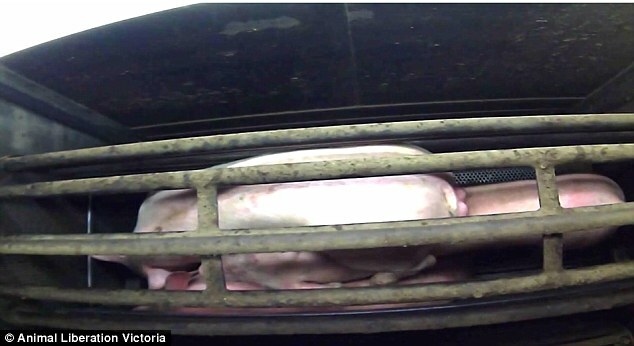 The cages then appear to be lowered into a gas chamber where the animals fight for air and escape while squealing and screaming before collapsing. 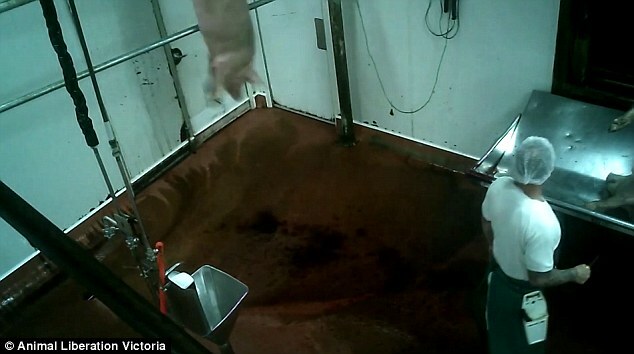 One of the abattoirs says that it is ‘RSPCA accredited’ on its website. 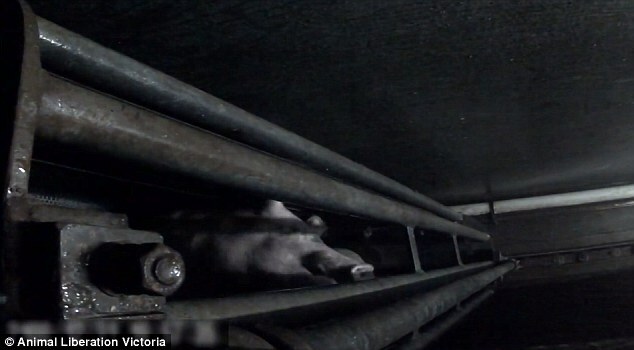 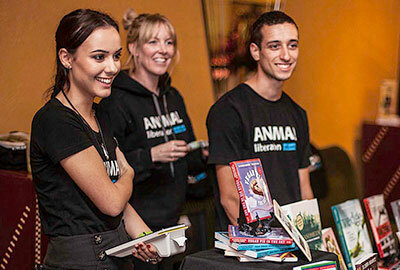 ‘The industry tells the public that gas chambers are a humane slaughter method and wants us to believe that the pigs gently fall asleep, however nothing could be further from the truth.’ Animal Liberation Victoria said in a statement. 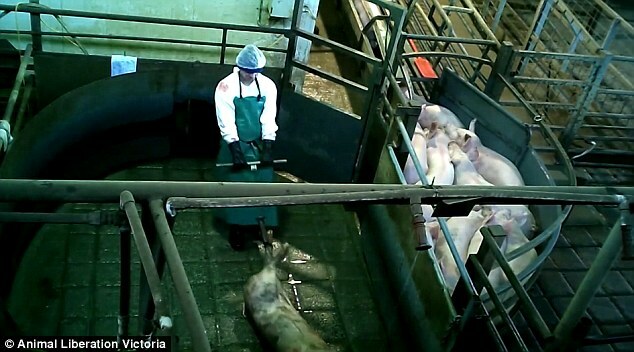 ‘The investigation involved climbing down into a gas chamber while wearing an oxygen tank to position hidden cameras. 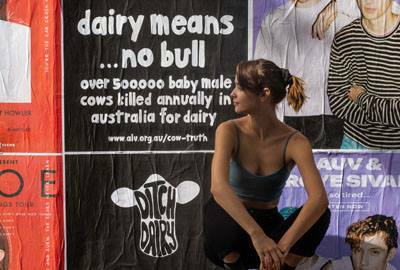 The activist who did so immediately noticed their eyes burning, which led to the discovery that when carbon dioxide reacts with liquids or mucus coated membranes (like that of the eyes, nostrils, sinuses, throat, and lungs), it forms carbonic acid. 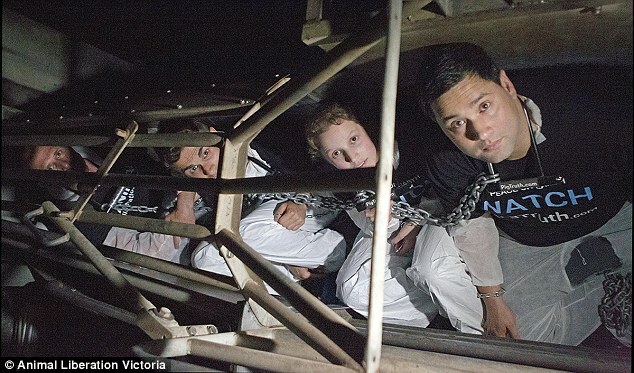 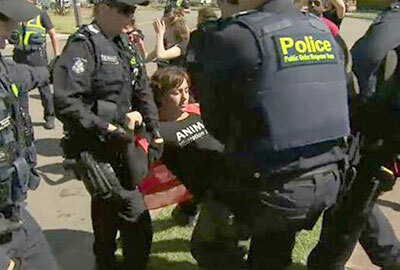 The confronting footage was released as activists chained themselves to an abattoir in Laverton in an attempt to block trucks transporting the pigs. 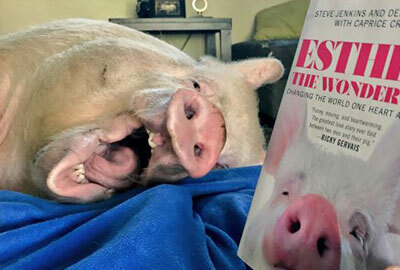 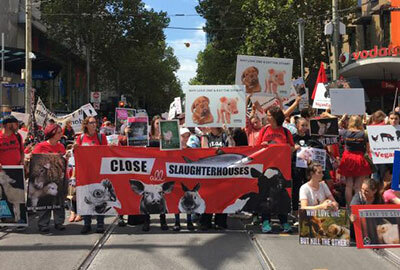 ‘All activists involved in this action have taken a vow of non-violence and are putting themselves peacefully between the innocent animals and the horrific death that awaits them,’ ALV Founder Patty Mark said. 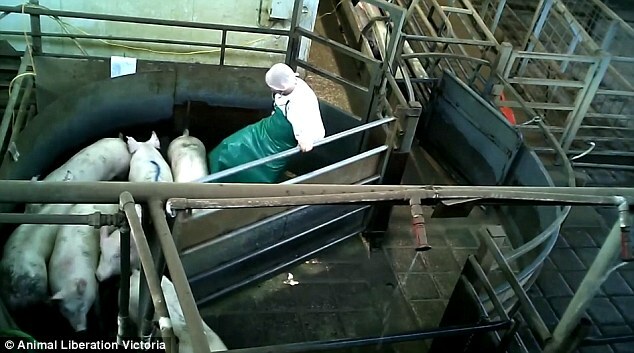 ‘We are closing down this slaughterhouse for as long as we can – not just to draw attention to this torturous method of killing – but to draw attention to the violence that is inherent in animal agriculture. 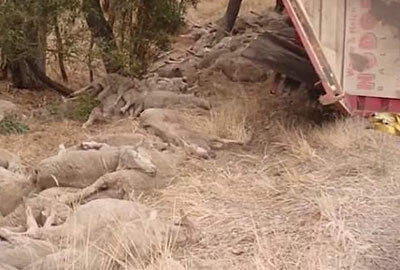 A spokesman for Minister for Agriculture Barnaby Joyce said their needs to be a ‘zero tolerance’ approach to animal abuse, and that he ‘hoped action was being taken’ after the video emerged. 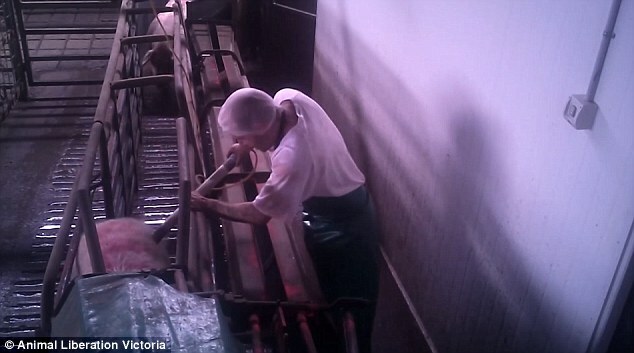 Daily Mail Australia contacted the companies filmed in the video.